Because apparently I’m not busy enough already, I’ve started another blog! B’WANA BEAST’S BLOG – A blog dedicated to DC Comics’ Jungle Master – B’wana Beast! For the past two years, I’ve run a site dedicated to Firestorm the Nuclear Man. While I enjoyed writing about Firestorm, I felt it was time to move on to something new. When I started the site in January 2009, Firestorm had been reduced to a minor character. His monthly series had been canceled for a third time, and he was a junior member of the Justice League of America. It was easy to keep up with his appearances and I could spend lots of time focused on his history. I liked that formula. Nowadays Firestorm is practically mainstream, appearing in DC’s number one selling comic Brightest Day. With rumors abound of a new Firestorm ongoing series, I felt it was time to move on before it became too difficult to keep up. B’wana Beast has always been my favorite character and after searching around the web I haven’t been able to find an active blog dedicated to the character. I decided it was time to bid Firestorm a fond farewell and follow my heart. Thus was born B’WANA BEAST’S BLOG! At B’WANA BEAST’S BLOG I’ll discuss all things about the character. 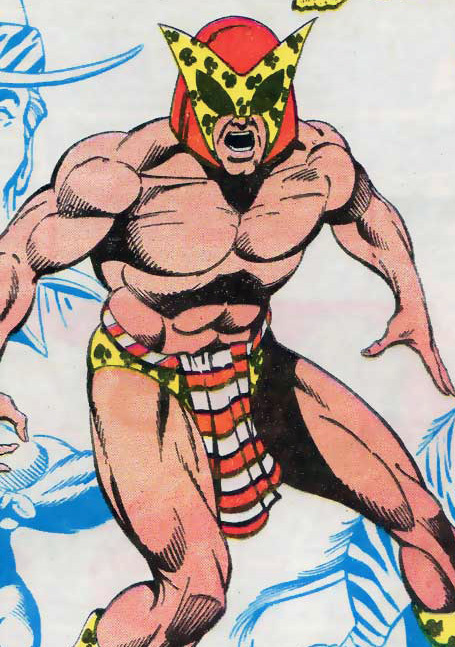 I’ll be covering both B’wana Beast and Freedom Beast, comic books, toys, cartoon appearances, memorabilia, advertisements, my own editorial thoughts on the character … just about anything related to B’wana Beast. For example, today I published posts featuring some of B’wana Beast’s cartoon appearances, best comic covers, action figures, and more! That’s the general idea behind the blog. So please feel free to stop by anytime or subscribe to the RSS feed. Support B’wana Beast! Do Justice to the Jungle Master! This is clearly the greatest idea you’ve ever had. Shag, you’ll do anything to pimp out Firestorm Fan. Because nobody will ever care about it. I kid I kid! I love your episodes on Views! Don’t hit me with your hook hand!